Shumard oaks are in the red oak family. The scientific name is Quercus shumardii. As one of the largest species of the southern red oak group, they are beautiful, long-lived trees that grow enormous and live for a long time, often over 100 years in the right growing conditions. They are also prized for their beautiful red fall color. 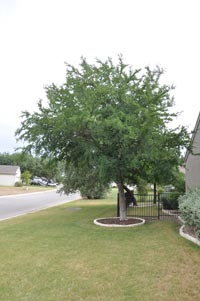 They are on the list of trees recommended for the Austin area. Shumard oaks are all over downtown Austin and we have often pruned giants in the central Austin area. That said, shumard oaks require deep soil. The central Austin area has, generally speaking, deep soils. A tree in general needs a 2 foot soil depth to thrive, although of course most of the absorbing roots responsible for the uptake to the woody conducting or anchoring roots are found in the upper 8-10 inches or less of the soil surface. Unfortunately for shumard oaks, although they thrive in deeper soils such as Northwest hills or central Austin, they are not well suited to shallow limestone soils. Limestone holds iron in an unavailable form for many plants. When iron is unavailable to a plant, it results in interveinal chlorosis. This is basically a yellowing of the leaves of the plant, while the leaf veins typically remain green. Some water problems can manifest themselves similarly, however on shumard oaks, iron deficiency is quite severe. The trees basically turn a bright yellow, resulting in marginal leaf necrosis (die-back), where the leaf eventually shrivels up and falls off. This leaf loss leads to chronic defoliation and death. Fertilization and iron amendments can provide temporary solutions, but are rarely recommended because they cannot take the place of inadequate soil requirements. Expensive and time consuming solutions such as soil amendments and radial trenching can be attempted, or adding topsoil and mulch over the roots in small enough amounts so as not to suffocate the absorbing roots. Generally, we recommend removal and replacement. Often, the shumard oaks will thrive for a number of years, showing no signs of yellowing for as many as 7-10 years in some cases. Then, the trees outgrow the available soils/root ball, and hit the limestone. At this point, they yellow and go into irreversible decline. We recommend not planting a shumard oak unless you have good soil. If you are looking for a similar tree that will grow well in high caliche limestone soils, I recommend picking out a Spanish oak, which is the native Southern red oak, Quercus falcata, to this area. It has evolved to these soils, and can thrive even in high limestone, rocky Austin soil, although it grows better and is healthier in deeper soils. It also gives red fall color during leaf senescence. https://centraltexastreecare.com/wp-content/uploads/2015/06/austin-tree-care1.png 0 0 Andy Johnson https://centraltexastreecare.com/wp-content/uploads/2015/06/austin-tree-care1.png Andy Johnson2012-05-22 16:00:072012-05-22 16:00:07Is your red oak turning yellow?